I did my first book signing yesterday. It was kind of impromptu and was mentioned only on Twitter at practically the very last minute. This signing occurred at my son-in-law’s shop, Kurt’s Magic World, in Lansdale, Pennsylvania and because it was a holiday, I didn't know what to expect. The only way people who are not on Twitter knew I was there, was from a small sign posted in the shop’s front window. My first sale was to Kurt’s friend Marlon, who from my daughter, knew the book was about my Italian upbringing. He said he was buying it for his mother who was also Italian and could probably relate to it. I thought that was sweet, but it was only the beginning. 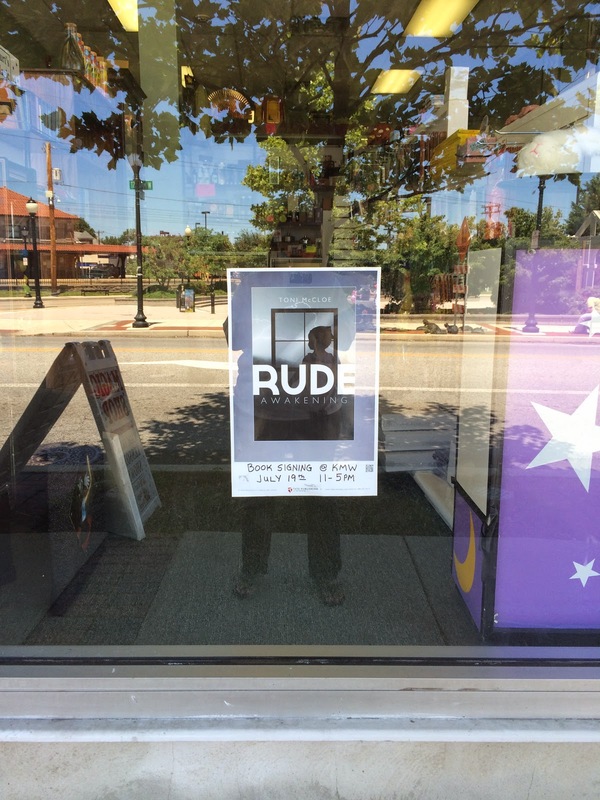 About an hour later, a young man rushed into the shop and up to the table where the book, Rude Awakening, were displayed. “Oh, is this the book?” he asked, touching it as though he thought it was the Holy Grail. Of course, I loved it. “I don’t have any money,” he said. “I just wanted to see it.” I smiled and asked his name. He told me and said he was a student. After we spoke for a moment, he smiled and left and I found myself wondering if he felt as good after this brief encounter as I did. Later, a woman and her daughter came in looking exultant after finding me sitting behind the table. “Wow, we just love the title and had to come in,” one of them said while the other said, “We love the picture on the cover, too. After buying the book, the woman said her name was Anita and that she lived in Harleysville. She also said it was her birthday – she was born on the Fourth of July. All in all, it was a delightful night for me and a sweet, sweet start to my book signing career. And to celebrate, I would like to give away a copy of the book to the first person to comment below.